Hey everybody, I’m Jake and I’ll be “guest blogging” about this year’s Delray Beach Open. This is the first of two posts about the event, as I’ll also be covering Sunday’s finals. The Delray Beach Open has to be one of the homiest stops on the ATP World Tour. With just seven hard courts (three used for matches, four used for practice), it’s so easy for fans to capitalize on the close access to their favorite players. Monday’s “Order of Play” had an extremely limited schedule, with only four matches (two singles, two doubles) available for the day session. The first match featured on Stadium Court was a doubles encounter between wildcards Bjorn Fratangelo/Dennis Novikov and unseeded duo Mikhail Kukushkin/Illya Marchenko. After just three games of play, the match was interrupted by rain. While play was suspended on stadium, I had ample opportunity to check out the action on the practice courts. Out on Court Five was former US Open champion, Juan Martin Del Potro. Though he hasn’t played since last years Miami Open, he looked relatively sharp at the tail-end of his session with a hitting partner. While I’m elated to see him back on the tennis court, his forehand and serve seemed to have lost some bite since his days as one of the tour’s top players. I am really looking forward to tracking his progress during the week and hopefully the rest of the season. When the doubles match resumed, the Kazakhstani/Ukrainian pair seemed totally flat. Unforced errors flew off the racquets of both Marchenko and Kukushkin, leading to the American duo taking the first set 6-1. That’s when the downpour came. This pattern of on-again-off-again showers would occur over the next three hours. Play resumed at about 3:15pm, and there was a huge increase in intensity/quality from the higher-ranked pair. Both players began to direct most shots to Bjorn Fratangelo, who was clearly the weaker of the two Americans. One of the weakest parts of Fratangelo’s game – and maybe a reason why he struggled with the transition from junior to professional – is his serve, which seemed to “serve” (no pun intended) as a point-starter rather than point-winner and crumbled in pressure situations. 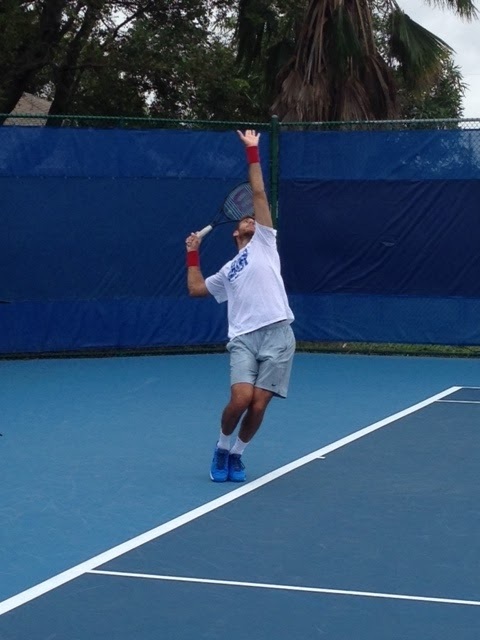 Novikov, who has qualified for the main draw in singles, seemed much more comfortable on the doubles court than his partner, probably as result of his two seasons playing for the UCLA Bruins. The match eventually went to a ten-point tie break, where the team of more seasoned players were able to capitalize on loose errors from their opponents to trudge into the second round. About five hours after play initially began, the first singles match of the main draw started on Center Court. 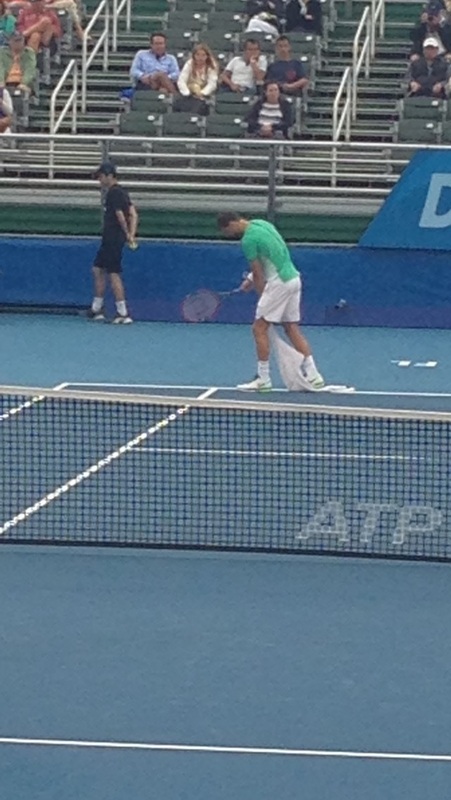 While the start-time of the encounter between fourth-seeded Grigor Dimitrov and Dudi Sela was briefly threatened by light rain (which interrupted the warm-up – and saw Grigor actually grab a towel and dry the lines himself – pictured below), the result was never in doubt. Dimitrov played an extremely solid match from the baseline, especially given the windy conditions, to move on comfortably 6-4, 6-2. One of the highlights of the match was the fact that both players have one-handed backhands (with different follow throughs). While Dimitrov seems to whip the racket around his head on each stroke, Sela just seemed to continue to move the racket upwards. I was impressed by the Bulgarian’s serving during the match, as he won 92% of his first serve points and seemed to be routinely hitting serves in the 120-130 mph range. I am hoping Dimitrov can use this tournament as a stepping-stone to getting back to the form that saw him reach the semifinals of Wimbledon two years ago. I pray to the tennis gods that I’ll be able to see him play again during Sunday’s final. Once that match concluded, I quickly shuffled down to Court 1 in order to catch the conclusion of the Mannarino-Jaziri match, which had been rescheduled from Center Court due to the rain. When I arrived, the number eight seed was already up 3-0 in the final set, and Jaziri was becoming increasingly frustrated with the Frenchman’s counter punching ability. What I enjoyed so much about Mannarino’s game were his quick backswings of both sides and his scrambling ability. Note: I’m a sucker for counterpunchers. The top-spin on “Manna’s” forehand was clearly troubling Jaziri, who angrily hit two one-handed backhands (one out of the air) to basically gift away the match. It’s interesting that in both of their two encounters Mannarino has come back from a 1-6 first set to be victorious. Trying to squeeze the most out of my day session ticket, I did one last lap around the courts. Practicing on Court 2 were Steve Johnson and Sam Querrey. In what didn’t seem to be the most productive of sessions, as the points were extremely quick and Steve seemed to be getting a little aggravated at times, both players were exchanging jokes with each other and the near-by Mardy Fish and Patrick McEnroe. Next door on Court Three, Tim Smyczek (a wildcard into the event) was hitting with qualifier Tatsuma Ito. Lastly, Taylor Fritz (the recent runner-up in Memphis), was out practicing with Leander Paes on Court 6. There seemed to be a decent crowd watching the teenager hit, and I’m sure he will get a lot of media coverage if he progresses into the later stages of the week. I did have the pleasure of hearing a conversation between Fritz and McEnroe, in which Patrick’s daughter shared that her nickname for the eighteen year-old is Taylor Swift. Side Note: I did see Vania King walking around the venue, nice to see some local support from the Boynton Beach resident. I hope everyone enjoyed reading this and I’m looking forward to potentially blogging more from Sunday’s Finals and the Miami Open. Thanks to James for letting me contribute to his wonderful blog! Great article, Jake. I’m looking forward to seeing how DelPo does. Hopefully you can get around to writing more from the finals and Miami, and that Dimitrov makes the former. What a dominant serving display for DelPo, 92% first serve won and without facing a single break point! Looks like 2016 gonna be an exciting year for ATP. Great news to wake up to! Still tentative with expectations for DelPo but all sounded reasonably positive.